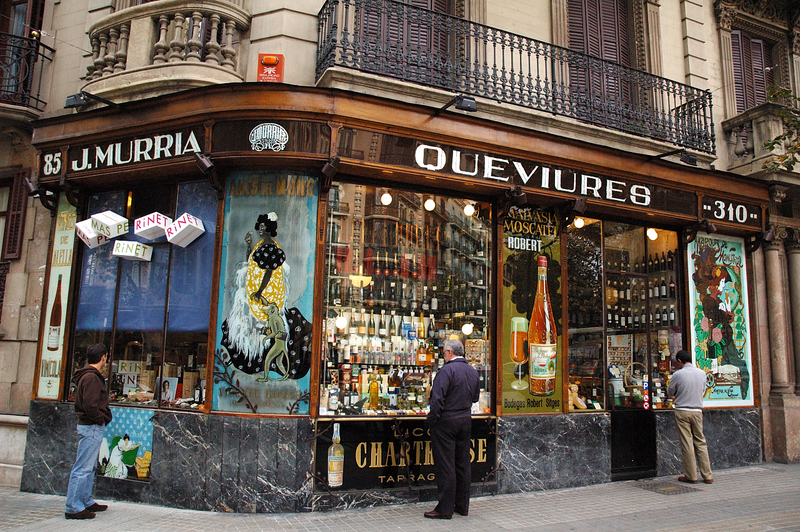 This is a small shop called Queviures Múrria (Cat.) or Colmado Múrria (Sp.) and located in the Eixample quarter, at carrer Roger de Llúria 85. The shop was opened in 1898 and it was called "La Puríssima" but it was a coffee roasters’.It is another example of Catalan Modernisme, one of the many scattered all around Barcelona. There are beautiful signs on the exterior like the one at very corner which has been preserved, advertising famous Spanish brands such as Anis del Mono, a strong anisette liquor still on sale. This grocery store is one of those in which we can still find the savoir faire of family traditions and the excellency of good products so elegantly exhibited that you can't help stopping to look compulsively at the shop window like the three men in the picture. so interesting shop for me. and i like that beautiful signs on the corner!! the three guys are so interesting in the photo!! Yes, a feast for the eyes. Window display is an art.